I love this city because of its balance of history, sights and city life. There is so much to do and experience that being there never gets old. There are two things that are synonymous with DC for me- Amsterdam Falafel House and Lincoln. I know I know. Lincoln is from Illinois but the Lincoln memorial always leaves me in awe. Seeing his handsome statue is something I must do and so we visited at 2am after my arrival! There was no one there and his statue was just beaming through the pillars. 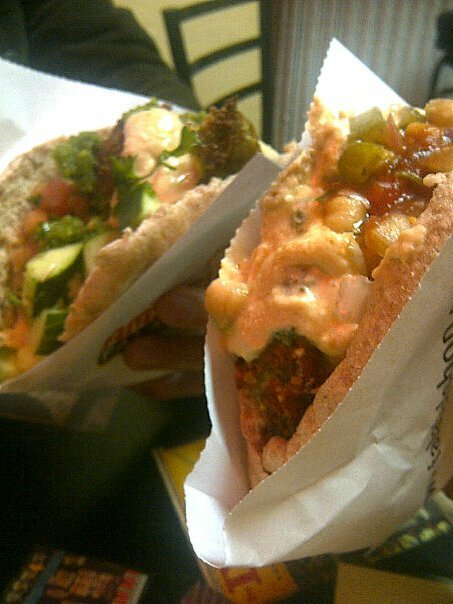 And the falafel doesn't need an introduction, you can just look at the picture and understand. I decided to visit during the famous Cherry Blossom festival and fell in love all over again. Almost every neighborhood had cherry blossoms blooming and the sunny weather was great for exploration. Walking around the tidal basin required some patience because of the massive amount of visitors, their dogs and bikes. When you are ready to escape the crowd, nearby is a fresh seafood market where you can get delicious crab cakes, all types of fish and pies! The festival lasts about two weeks and there are loads of different activities planned. Another great thing about DC is the vast variety of museums on the mall you can visit for free. Depending on your interests, you can have a weekend just for museums. Since I have been a few times already, this trip focused more on neighborhood exploration. But a few great museums would be the Natural History, Air and Space, and the Modern Art. If your trip includes some weekdays, you can also do tours of the White House, Congress and Supreme court. My exploration included a visit to Eastern Market, a quaint neighborhood with a flea market, fresh foods of all kinds and loads of nice coffee shops. As for the nightlife, it isnt as extensive as New York's but has three distinct neighborhoods- Adam's Morgan, Dupont Circle and Georgetown. Each has its own vibe depending on what you want. Food also varies from massive pizza slices in adam's morgan to highend dining on the harbor but some great finds include Ben's Chili bowl, delicious Ethiopian and of course falafel. And i cant wait to be there!! !